The Tommy Chong Podcast is coming soon...again. First, there was his PotCast. Then, there was the Chong and Chong Show which included his son, Paris, for whatever reason. Next up is the Tommy Chong Podcast. It will be presented by Cannabis Radio. LAHAINA, Hawaii, Feb. 11, 2016 /PRNewswire/ -- Get your vacation planned for Maui! 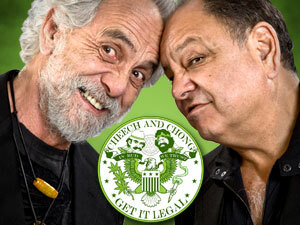 Cheech & Chong are coming! Successful beyond their wildest dreams, the iconic comedy duo Cheech & Chong defined an era with their hilariously irreverent, satirical, counter-culture, no-holds-barred comedy routines. Cheech Marin and Tommy Chong's phenomenal success began on the stand up comedy circuit which led to 9 hit comedy albums and 8 hit films, breaking box office records, shattering comedy album sales, garnering multiple Grammy nominations and mesmerizing fans for more than a decade. Crooner Brian Evans, one of the countries most successful big band crooners in the style of Frank Sinatra, will perform hits such as "At Fenway," "Creature," and other songs that have amassed tens of millions of views on YouTube. As the former opening act for stars such as Jay Leno and Joan Rivers, Evans new CD will be supported by several music videos including "Here You Come Again" and "Planet Blue," a video to be directed by William Shatner, who portrayed the home plate umpire in Brian's wildly popular Red Sox video "At Fenway," which has reached almost 12 million views. His music is heard on shows ranging from "So You Think You Can Dance" to "BoJack Horseman" on Netflix. His "At Fenway" video has been added to both The National Baseball Hall of Fame and The Baseball Almanac. He is the first artist ever to film a music video at The Bates Motel, the actual film location of The Alfred Hitchcock thrilled, "Psycho." Last month, The Maui Celebrity Series presented Academy Award winner Jeff Bridges to a packed house. This will be the 28th concert produced by The Maui Celebrity Series. Past concerts included David Spade, Mos Def, William Shatner, Bob Saget, among others. The Governor of Hawaii, David Ige, issued Evans a Commendation for bringing The Maui Celebrity Series back to the island last month. A portion of the show proceeds will benefit Mental Health Kokua and The American Sleep Apnea Association. Follow Brian on Twitter @croon1 for more information about this crooner that is about to take the world by storm. Tommy Chong has lost so much weight from chemotherapy that he needs to smoke marijuana to keep his appetite and to keep happy. He tells Rolling Stone magazine that he still has five months of chemo remaining. Cheech and Chong have been doing stand-up here and there, but Tommy says he spends most of his day laying in the sun. As you recall, he served 9 months in federal prison in 2003. He's hoping that if he supports Bernie Sanders, he'll receive the pardon he's been seeking. Legendary Howard Stern Show wackpacker, Crackhead Bob, passed away on January 18 - 20th at the age of 56. His real name was George Harvey, but was unable to say the word George after multiple crack-induced strokes. Before I reunited Cheech and Chong, Tommy Chong was auditioning people to replace Cheech. Crackhead Bob was one of these people.